Sun is the most powerful object in our solar system. It is so big that more than a million earths can easily fit inside it. It provides us warmth and light which helps the earth to sustain life. Nearly all of our energy needs are fulfilled by the Sun. Without it, life on earth wouldn’t be possible. But the sun is also violent and volatile. It can play havoc with our modern day lifestyle. We are becoming more and more dependent on technology; our cities survive on complex network of power lines and communication systems rely on satellites. They can all be wiped out by the Sun. The Sun ejected a huge cloud of charged particles which hurdled towards the earth at speed of million miles an hour. On evening of March 13th it struck the earth. This caused a huge electromagnetic disturbance over the Northern hemisphere and people in Quebec, Canada witnessed its full force. The power grids were overwhelmed with more than a million amps of electrical current in less than a minute. Quebec lost half of its power generation and around 6 million people were left without electricity for more than 9 hours. The only lights that could be seen were the Auroras or commonly called the Northern lights as far as Cuba and Florida. In space, some of the satellites actually tumbled out of control as the highly sensitive electronics were disturbed by highly charged particles. This event caused millions of dollars in damages. Solar Flares are the explosions caused by the high magnetic fields at the sunspots. Sunspots are the cooler regions on the surface of the sun that entrap some of the intense energy below them. When the twisted field lines cross and reconnect, the energy explodes outwards with a force exceeding more than million hydrogen bombs. The magnetic field lines that twist up to form solar flares occasionally become so wrapped that they snap and break forming gaps that no longer hold sun’s plasma and explode into space as Coronal Mass Ejections (CME). Usually the earth’s magnetic field or the magnetosphere protects the earth from these charged particles and deflect it to its weakest point at the poles. Here they react with the particles of air to create streams of different colours which we call the Northern and the Southern lights. 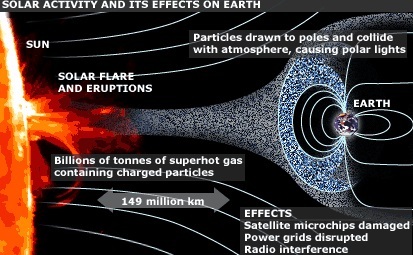 But when intense solar storms occur, they breach the magnetosphere like the one happened in Quebec, Canada. Solar storms can have atrocious effects on communication systems. During the solar storms, high frequency communications get wiped out which can be dreadful especially for the airlines where the only communications with the pilots is via high frequency radio. Other communication systems can also get knocked out as the satellites get damaged which can cause loss of signals, resulting in communication blackout. GPS is a system of 31 satellites and each of them will get affected thus no online mapping services and all the work which depends on GPS will stop. Geostationary satellites which are used for mobile communications will stop working and there will be a severe communication black out. There will be no way you will get to know what’s happening around the world. If the power grids get affected like the one happened in Quebec city there will be a severe power black out and the only light in the night will be the unusual Auroras giving the world a ghostly look. Imagine a world with no power, no mobile communications, no radios, no airplanes. The world will loose it’s past 200 years of technology advancement. It will be 1800’s back. 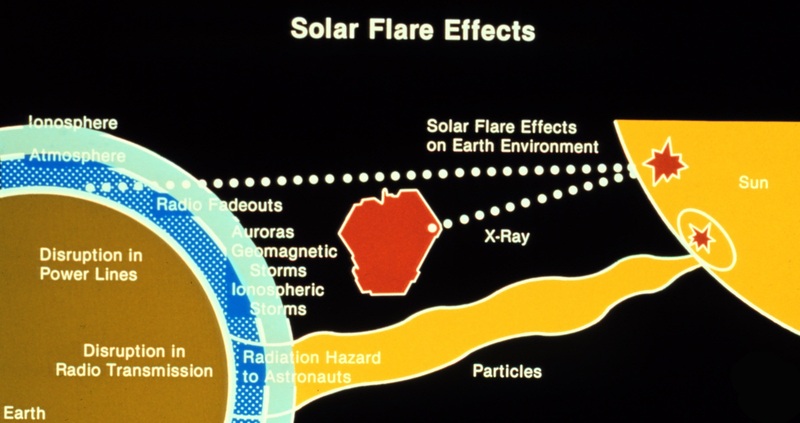 Not only the communication systems or the power grids get affected, solar flares can do more. They increase the risk of radiations which increases the risk of skin cancer. We are saved from these radiations by the ozone layer but for astronauts out in space, it is a potential threat. If astronauts find themselves in the way of solar flares, they can get killed. High energy particles released by solar flares consist of protons which can pass through human body, causing chromosome damage and cancer. Large doses of radiations can be lethal. A large enough Solar storm can also also affect people on Earth causing skin cancer and many other skin related disease. World will get a hell like appearance with all of our technology frying in the anger of the most powerful object in our solar system the sun. Sun is the life giver of Earth but it also has life taking ability which might be catastrophic for the humanity. Previous ArticleTop 5 Android Launchers that you must try out! Engineering student who has a desiderata for technology and innovation. Science fiction and Physics are two genres that I love to twirl together.